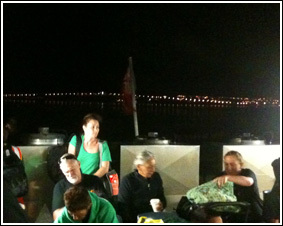 Over 75 Ngāi Tai met at Auckland's downtown ferry terminal at 5:30am on Saturday the 23rd of March 2013. 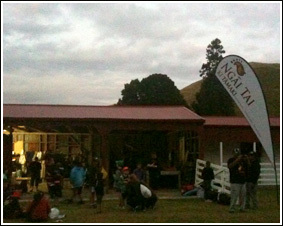 We were all gearing up for the DUAL event which is held on our beloved Te Motutapu a Taikehu this time every year. Most of us were participating in the 6k and 10k run with Johnny Clarken and Wirimu Welsh competing in the half marathon. 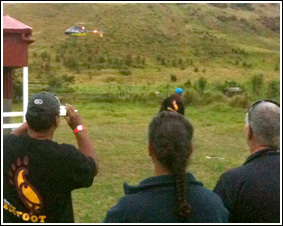 We also had a small support team on hand for our tamariki. Auckland looks stunning at this time of the morning with the city lights and residual lighting from the outlying suburbs shining on the tranquil Waitemata. At 6:00am we were all on board for what seemed like a night time trip. 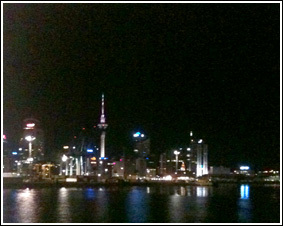 The Waitemata was pitch black and it was very hard to see anything. 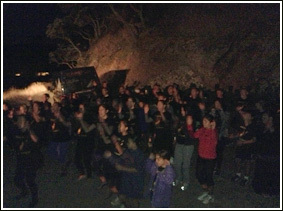 We were all wearing our Team Bigfoot t-shirts with our tamariki in their Team Little Feet t-shirts. Everyone looked awesome. I couldn't help but have a small amount of nervous energy in anticipation of the days events. A special part of the morning was going to be performing our haka pōhiri that we had practiced diligently for the past month. James and Zaelene had done their best to whip us into shape. It was now up to us. When we arrived at Motutapu around 6:30, the captain asked all passengers to remain seated as Ngāi Tai needed to get off first. 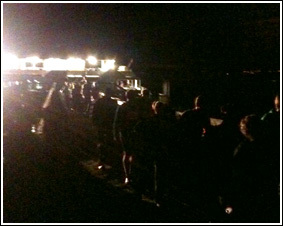 Ngāi Tai disembarked before the rest of the ferry and setup at the end of the wharf for our haka. The people on board had no idea what was going on until they disembarked and were asked to wait on the wharf right in front of us....this was it. We all walked a few hundred meters to what would be our base for the day, the 'Red Shed'. This was a great place to have our base as we were away from the main start finish area yet able to walk there in less then a minute. The sun had still not risen. There was still that feeling of peace only found in the early hours of the morning. We all settled in and after a small briefing of the days events slowly moved down to the start line so we could tautoko James when he lead the karakia, mihi and started the first race. Again Ngāi Tai were leading the day and making sure the event started with the appropriate tikanga. 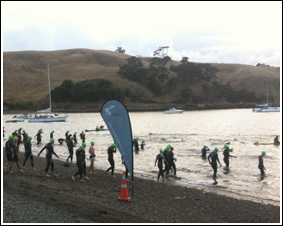 The triathlon was the first event of the day with an 8 'o' clock start. The water looked cold and the view looked magnificent. 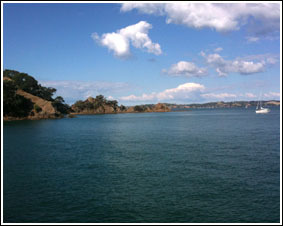 Part of the attraction of these events is the spectacular scenery of the Waitemata and surrounding islands. There are breath taking views as you run along some of the ridges of the island. Everything looks beautiful. 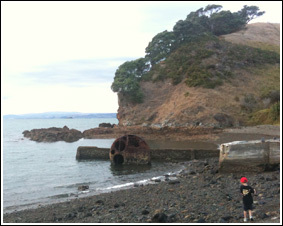 Motutapu still has a feeling of being quite isolated and untouched by the hand of modernisation. 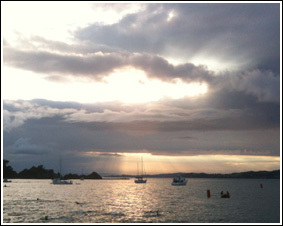 For those from Auckland this is a welcome distraction to the frantic lives we all seem to lead. This was a chance to breathe in this beautiful island and relax in a place where time forgot. It was great to see the tri athletes do their thing, while a helicopter filmed them from above. The day was underway, with the first event getting off to a great start. There were a myriad of events on the day starting with the triathlon. There was a 50k and 30k mountain bike race. There was also a 6k and 10k walk or run depending on your choice and the mighty half marathon and marathon. The half marathon and marathon competitors were lucky enough to be able to run to the summit of Rangitoto. There was literally something for everyone. 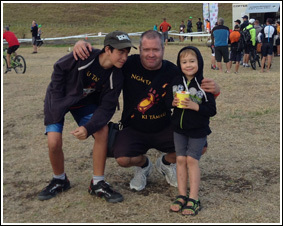 Ngāi Tai have always been keen supporters of the DUAL event. Total Sports with Aaron Carter at the helm have managed to make the DUAL better every year. A shout out to the Total Sport Team is the least we can do for their help and support. This is where their support for us and our support for them adds up to more then the sum of those parts. AWESOME!!! Some of the best memories are from in between the races. Seeing our tamariki on the beach collecting rocks and shells...playing with each other laughing, joking and sharing. This is whānaungatanga and kotahitanga in practice. These are the images and thoughts gleaned from our initial idea of using sports events to encourage 'fanau, fitness and fun'. To date this kaupapa has been so positive. It really does have a profound effect on our young ones. It shows them that sport and fitness are a part of every day life. They see their parents doing it also so it seems normal. The fact that their cuzzys aunties and uncles are there too adds to the fun and the sharing of experiences. Most of us were competing in the 6k or 10k run or walk so there was plenty of time to catch up with whānau and re-connect with those that had not seen each other for a while. It was great to also see new connections and friendships made. The morning included eating heaps, hydrating and chasing children around while supporting those that were coming through the finish line during multiple events. 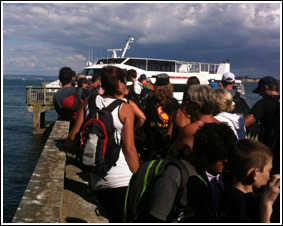 There were eventually over 80 Ngāi Tai tangata by lunchtime with some coming over on later ferries in time for their race. I entered the 6k and ran it with 2 of my children. 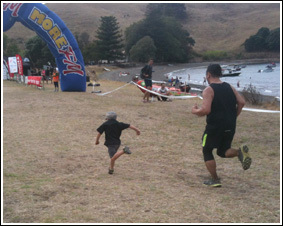 Alot of whānau took this opportunity to run with their own children. Congratulations to Johnny Clarken and Wirimu Welsh for there completion of the 21k run. Congratulations also to those who do not run regularly but took this opportunity to not only participate but to participate with their whānau. These events are about competing with yourself. It is not about winning or beating other people but immersing yourself on your own journey to get to the finish line. Throughout the day it was a privilege to see so many Ngāi Tai having fun, smiling and enjoying the day while challenging and extending themselves. The afternoon was spent comparing times and exchanging experiences of the various runs we had all participated in. There was food, music endorphins and we were lucky enough to be invited to the VIP tent of the Motutapu Restoration Trust. It was lovely to catch up with Christine Fletcher who along with the Motutapu Restoration Trust and DOC put in so much work and effort to keep the island pest free and maintained. 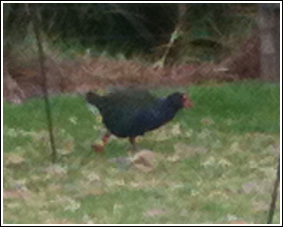 We managed to see 'Hemi' and his girlfriend 'Ella', 2 of only 240 Takahe on the planet today. Some of us were lucky enough to be able to reminisce about our earlier trip late last year when we released Kiwi onto Motutapu. It was the sort of day where nobody really wanted to leave the island. The day was long, hot and thoroughly enjoyable. If I had of asked for a show of hands for those wishing to stay, everyone would have raised their hand. As we boarded the ferry and found a seat I started to reflect on the day. There was a lightness and happiness inside me which stayed with me for days afterward. For me this is just the start of our Team Bigfoot and Team Little Feet kaupapa. This is the first event of the year with many more to come. All Ngāi Tai and their whānau are welcome to these events and we really do encourage as many people as possible to challenge themselves while surrounded by whānau, aroha and support. There were many a tired eyes at the end of this day... but waiting at home was a well deserved rest. Well done whānau, Tū meke, and bring on NEXT YEAR!!! !